Shaka what? 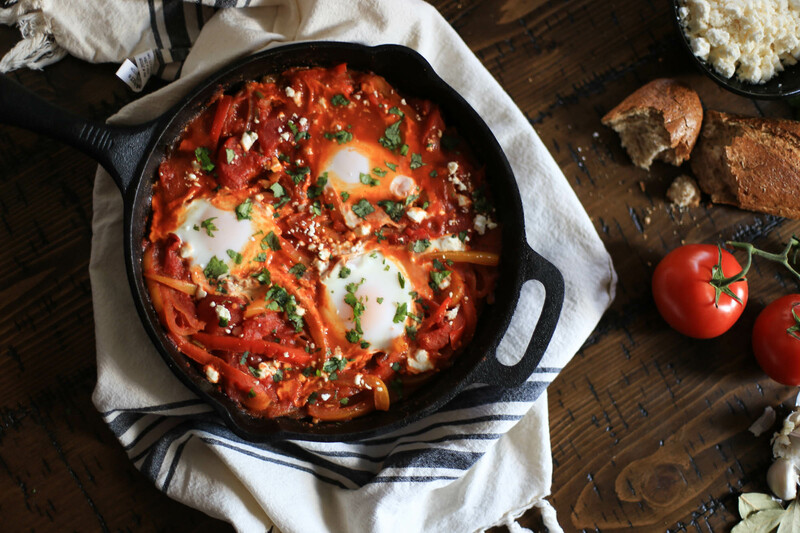 Shakshuka is the North African breakfast dish you’ve never heard of, but should make for brunch this weekend. Saucy goodness, in one skillet. Is it a breakfast food, is it a dinner food? Who can really say? I have made it for breakfast, lunch, and dinner so there is no wrong or right way. 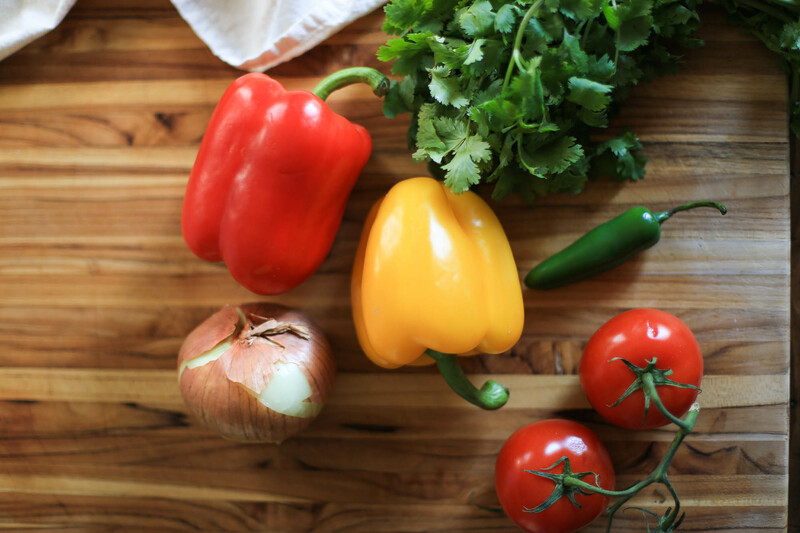 Tomatoes and bell peppers are stewed together on the stove, with eggs cracked in right at the end. 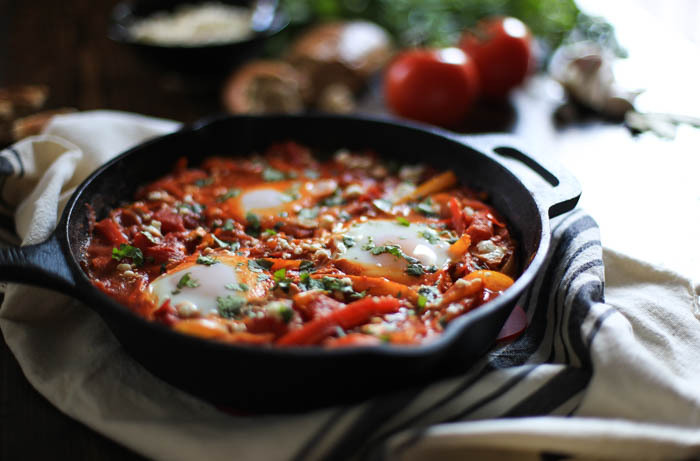 Perhaps you have heard of shakshuka, and have even tried it. Then you know. You know how delicious and flavorful it is. If you are in my immediate family, I’ve served this to you alongside another favorite breakfast skillet of mine (the most popular recipe on The District Table). That also means that I tricked you into eating a dish that is Paleo and even Whole30 friendly. Just when I though cooking Paleo food was the hardest, I decided to try Whole30 a.k.a. the most challenging diet EVER, with my sister (she’s doing it for Lent, and I hopped along for the ride). Trying to find meals that are free of sugar, grain, and dairy –and still tasty– is no small feat. 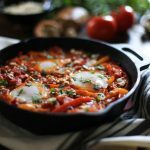 I didn’t even realize shakshuka was friendly to Whole30 when I started this post but can’t wait to make it a couple more times this month. One feature I love about this recipe is that it takes very simple ingredients and turns them into something completely savory and satisfying. When tomatoes are in season I use fresh ones for the recipe, but the rest of the year I like to substitute whole peeled canned tomatoes. Adjust the spice levels of the stew to your taste, plop in as many eggs as you want, and then serve it right in the pan. 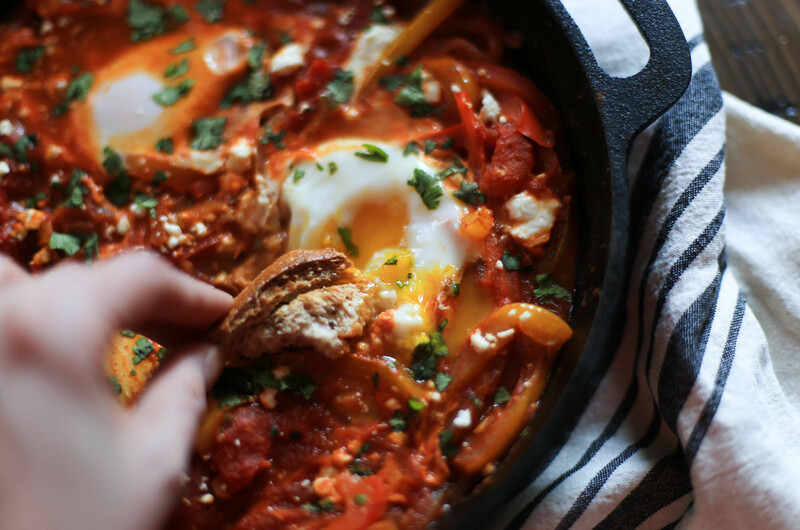 Admittedly, my favorite way to eat the eggs in shakshuka is with a giant piece of crusty baguette fresh from the oven. I am dreaming of baguette right now. But for those who are also warriors of Whole30, I think adding potatoes to the stew would be a nice touch instead. Serve hot and enjoy the comforting, savory stew with friends. Preheat the oven to 375 degrees F. Heat the oil in a large skillet over medium-low heat. Add the onion, bell peppers, and jalapeno. Sprinkle with salt and cook for 8-10 minutes, stirring occasionally, until softened. Add the garlic, paprika, cumin, and cayenne and cook for one minute until fragrant. Add in the tomatoes (with juices, if using canned) and season with salt and pepper to taste. Simmer over low heat until slightly thickened, about 10 minutes. Crumble some feta over the top, as an option. Make small wells in the mixture for the number of eggs you'd like to add. Crack an egg into each well. Transfer the skillet to the oven and cook for 6-8 minutes, until the egg whites are firm or until the eggs reach desired doneness. Sprinkle with parsley and serve immediately with a side of crusty baguette or pita. To make this recipe Paleo and Whole30-friendly, omit the feta and side of baguette. For Whole30 you could add in potatoes to eat with the stew.